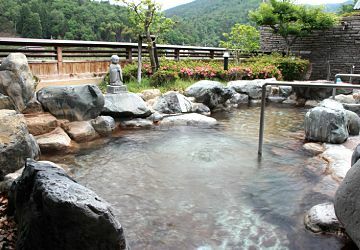 Located out in tranquil countryside of Tanto, southeast of Kinosaki Onsen, and surrounded by beautiful and lush nature. Geothermal heated hot spring waters come up through ancient granite located 1,100m underground and have a rich composition that has a reputation for leaving your skin feeling smooth, soft, and silky. There baths are separated by male and female. Both sides have indoor and outdoor hot spring baths. The outdoor baths are highly recommended. Enjoy the fresh, crisp air in the autumn and winter while you warm yourself in the springs. In the spring and summer, you are given panoramic views of the lush surroundings and treated to cool mountain breezes. 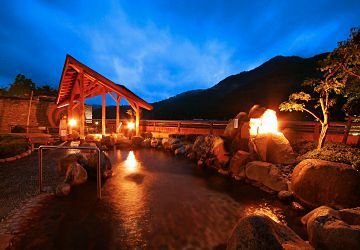 This spacious outdoor hot spring bath is located in the Hanano-yu. Sit and relax in the waters with the jizo, Buddha statue, leading you in meditation. Bathe under the glitter of a starry night. Out here in the quiet countryside, there are no neon lights to block out the beauty of the stars. This is a one-of-a-kind star-gazing chance. Sit under the strong stream of water as it falls onto your tired shoulders and back. 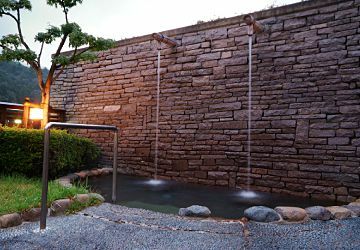 The sound of the running water is also sure to help you relax in the soothing surroundings. 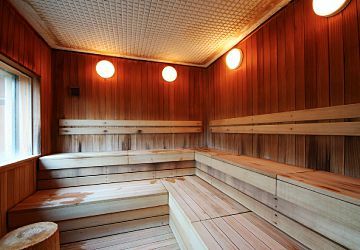 Take a seat on the wooden benches inside this sauna and let the stress of the day flow out of your every pore. Closed in the mornings every 3rd Wednesday (except in April, August, September, and November) on these days will open 5pm~11pm with last entrance at 10pm instead. You can get to Silk Onsen “Yamabiko” from JR Toyooka Station by public bus. If coming by bus you will need to transfer buses in Izushi.